With You Can Teach Yourself Fiddling, veteran Mel Bay author, Craig Duncan, has produced an excellent book for the beginning fiddler. Its 36 lessons teach basic techniques through specific exercises and traditional fiddle tunes. From holding the fiddle and bow correctly to playing moderately advanced tunes in double stops, Craig will guide you through each progressive step. Although it is not necessary to be able to read music at the start of this book, the author gradually introduces principles of effective note reading throughout. A unique feature of this book is that the same tune may appear in more than one lesson, increasing in difficulty with each recurrence. Each variation builds on the previous one and assists students in learning how to create their own arrangements. 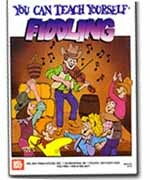 Even with some repetitions of the same tune, you'll find more than 50 popular fiddle tunes in the book's 80 pages. 'Check points' and reviews keep you on track from cover to cover. The companion video covers the first 17 lessons from the book.